Family Web Log, Again. : Monsieur Concasseur des Fourmis! This came home with Emeth not too long ago. Who knew a seven year old could be such a master of irony, sarcasm, deadpan, surrealism, and horror, in such a terse, minimalist style. We have noooooooo idea where he gets it from. The monster was as tall as a centipede. Not so tall. 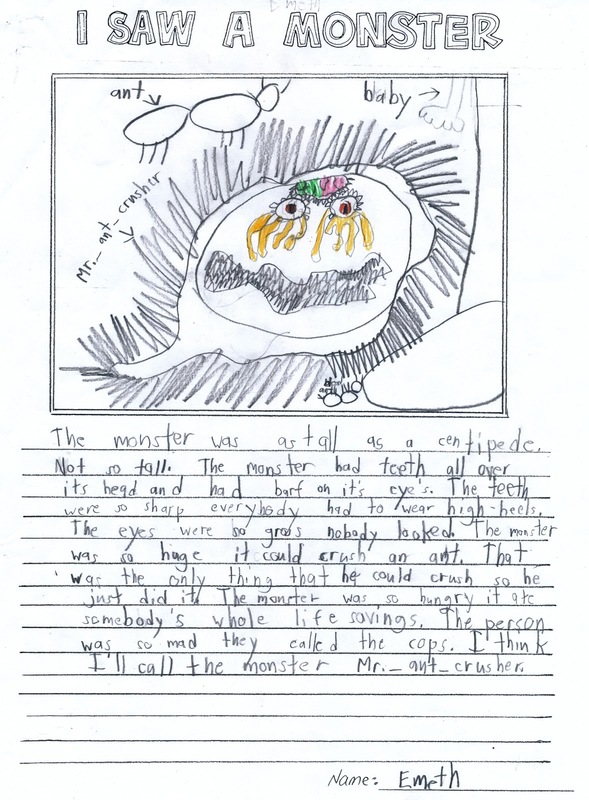 The monster had teeth all over its head and had barf on its eyes. The teeth were so sharp everybody had to wear high-heels. The eyes were so gross nobody looked. The monster was so huge it could crush an ant. That was the only thing that he could crush so he just did it. The monster was so hungry it ate somebody's whole life savings. The person was so mad they called the cops. I think I'll call the monster Mr._ant_crusher. And if that wasn't disturbing enough, here's another odd little piece he wrote with a classmate. They were assigned the name Charlie to use. There once was a male alien named Charlie. Charlie has green eyes. He hated his family so he punched them and ran away and went to earth. 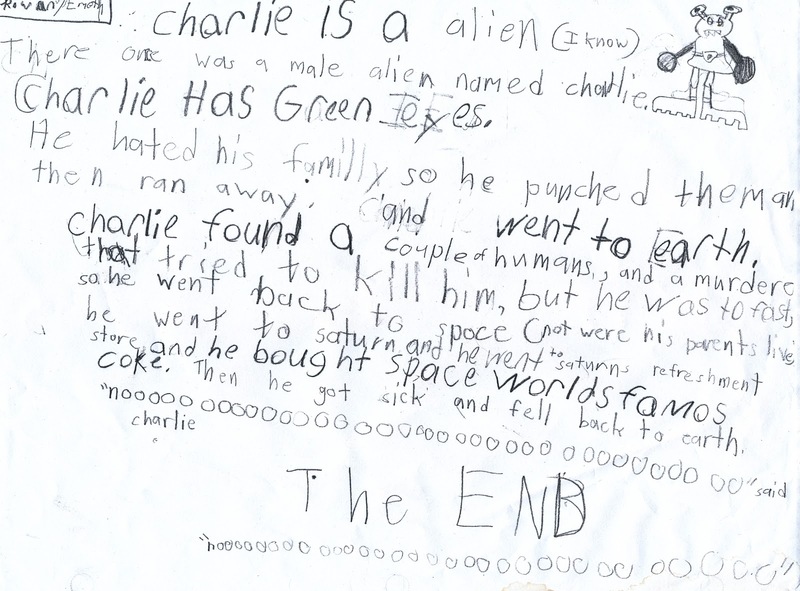 Charlie found a couple of humans, and a murderer that tried to kill him, but he was too fast, so he went back to space (not where his parents live). He went to Saturn and he went to Saturn's refreshment store and he bought Space World's famous coke. Then he got sick and fell back to earth. "Noooooooooooooooooooooooooooooooooooooooooo," said Charlie. That's our Em. Perfectly normal, and well adjusted, Em! better on paper than in the real world...absolutely love his writing...what does big sister have to say?